Following Historium, this new addition to the Welcome to the Museum series is a fantastic companion activity book. 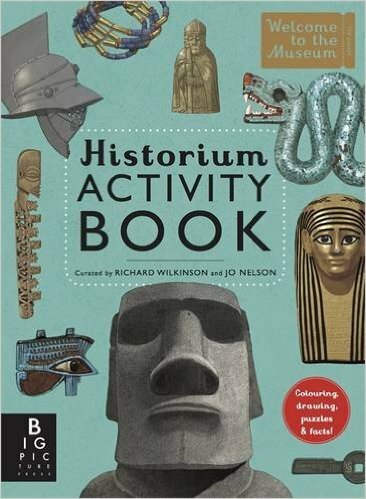 Bursting with fascinating facts and puzzles, this book offers hours of entertainment to artists and budding historians alike. Beautiful and inspiring, the myriad of activities in the book challenge the reader to discover something new and use their imagination to draw, decorate and design on every pull-out page. I usually review fiction so I struggled with this review because it's for a history book. But this book isn't a dry, dull read. In fact, it's not much of a read at all because it's a book stuffed full of activities based on historical artefacts from all over the world – though there's a tiny bit of factual information on the back of each page. This is definitely not a book for young children, but it might suit older children who love ancient history. I'm thinking possibly 10+, though that's a guess that may be wide of the mark. The activities include such things as numbering ancient figurines according to their age, colouring a page from the Lindisfarne gospels, finding the differences between two pictures taken from a fresco in Pompeii and spotting animals on an ancient Chinese belt buckle. There are also lots of drawing activities. The book's well produced, with very thick pages, but I have to admit that for some of the activities I felt that you needed more knowledge of ancient history than I have. But I was on safe ground with the colouring and the spot the difference pages! The answers to the activities are on the back of each page, together with a few facts, but I would have liked a bit more information at times. For example, there's a page inviting you to add decoration to the Battersea shield. The information on the back tells you a little about the Celts and about what the shield is made of, but why is it called the Battersea shield? I'm guessing it was found there, but I think I'll have to resort to the internet to find out for sure. And maybe that's one of the best things about this book: it gives a few snippets of information which will set a budding historian on a quest to find out more.